FiberStar's Class 4, Integration Laser Marking Systems offer the benefits of a Direct Metal non-contact, abrasion-resistant, permanent laser marking onto almost any type of material. High-speed, high precision, micro-marking FiberStar laser systems are ideal for a wide range of industries and integration applications. FiberStar Laser Marking Systems offer state-of-the-art technology with the highest laser beam quality and more than 30,000 hours of maintenance-free operation. High precision laser markings are achievable on almost any type of material including stainless steel, strength alloys, carbide, copper, titanium, platinum, aluminum, as well as a wide variety of medical-grade alloys and plastics. Identification text, serial numbers, corporate logos, 2D data matrix, bar coding, graphic and digital images, or any individual process data can be produced with laser marking. FiberStar's Class 4, Integration Laser Marking Systems offer the benefits of a Direct Metal Marking, non-contact, abrasion-resistant, permanent laser marking onto almost any type of material. High-speed, high precision, micro-marking FiberStar laser systems are ideal for a wide range of industries and integration applications. The FiberCube® laser marking and laser engraving system is a compact, turnkey marking, engraving and cutting system that offers the benefits of a non-contact, abrasion-resistant, permanent laser mark, laser engraving, or cut onto almost any type of material. 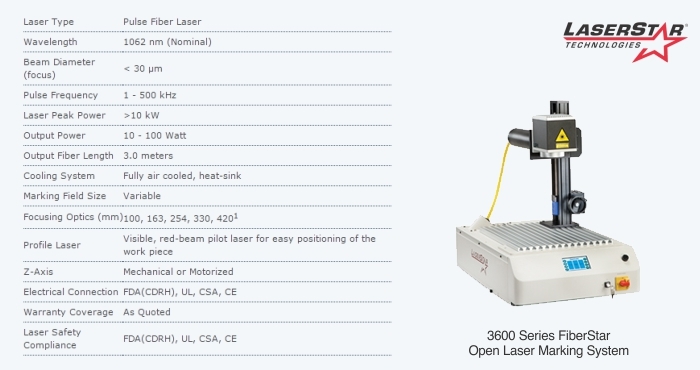 These laser marking systems offer the speed, reliability and flexibility required to meet stringent quality control and process certification standards. FiberCube® Systems integrate the FiberStar laser marking source and provide controllable pulse rates that can be adjusted from continuous wave to single pulse for deep laser marking, cutting, or fast throughput thermal mark applications at up to 200 characters per second. FiberCube® Systems are ideal for a wide range of applications including flat surfaces, advanced integrated XYZ motion for step-and-repeat laser marking, or coordinated rotary motion for seamlessly laser marking around a circumference. LaserStar's CAD2 operating software provides complete coordination of all integrated systems. 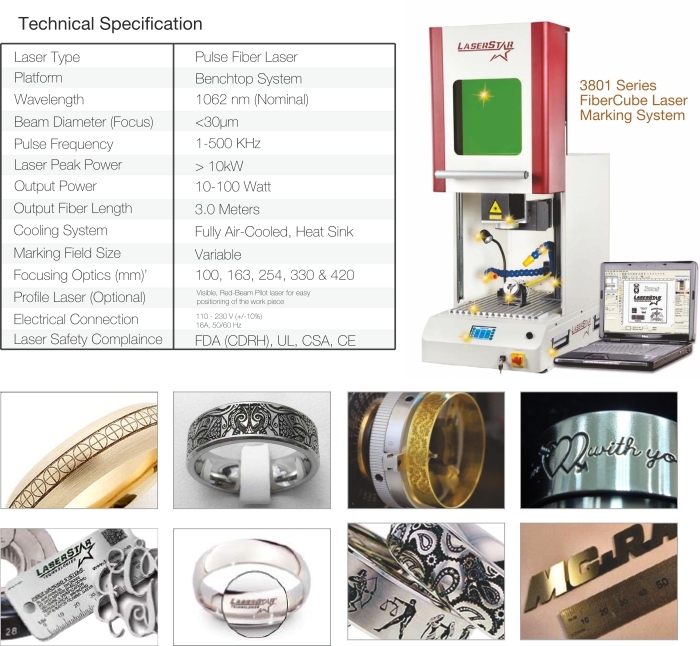 As a turnkey solution provider, LaserStar's Applications Specialists will evaluate your laser marking or engraving requirements, define the application goals and objectives, specify and verify the correct marking platform, and define a complete laser system configuration to accomplish the desired results.